CHATHAM — The Chatham Anglers and Harwich Mariners were knotted at one through six-and-a-half innings. Branden Fryman (Samford) had just walked — his third time getting on base — and was taking his usual large lead off of first base. In a flash, Greg Jones (UNCW) pulled a line-drive down the right-field line. Fryman darted off of first, churning his arms and legs as fast as possible. As Harwich began its relay, third base coach Randy Whisler refused to halt Fryman, who had lost his helmet on his journey, at third. Instead, he sent the Chatham second baseman home, and Fryman cruised across the plate standing up to give the A’s a 2-1 lead. Branden Fryman went 2-for-2 with two runs scored in Saturday's win. 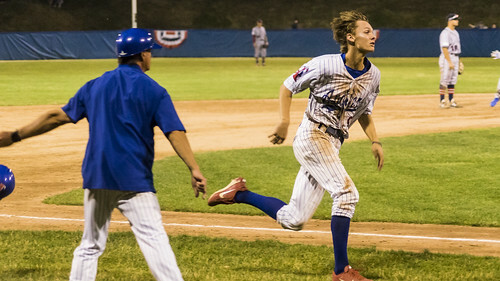 After the go-ahead run, the Anglers (8-6-2) never looked back in an eventual 5-1 victory over the Mariners (9-8-1) on Saturday night at Veterans Field. Harwich came into Saturday with one of the worst offenses in the league along with the top pitching staff. The Mariners ranked third-to-last in the Cape League in runs (60) and home runs (four). The staff held the lowest ERA (2.72) while allowing the fewest runs (52) in the league. Dan Hammer (Pittsburgh) has been one of Chatham’s best arms so far this summer, and he continued his brilliance on Saturday. The Philadelphia native posted his third scoreless outing of the season, tossing 4.2 innings and allowing two hits. Hammer faced the minimum of three batters in each of the first two innings, and a Rankin Woley (Auburn) wild throw to first kept him from doing so in the third. The right-hander’s clean-sheet came within inches of folding in the fifth inning, but Jorge Arenas (Stetson) came to the rescue. Gabe Rivera (Miami) chopped a ground ball toward Arenas, who was making his first start of the summer at the hot corner. Nate Eikhoff (Virginia) jolted towards home from third as the ball came off the bat, but Arenas’ quickness allowed him to gather the ball and fire to Nick Kahle (Washington) before Eikhoff could touch home plate. The effort was applauded with gusto by nearly 2,500 Anglers fans, along with Hammer, who retained his shutout. After a scoreless opening two innings, the A’s struck first in the bottom of the third. Fryman blooped a single to center field, stole second base, then advanced to third on a wild throw by Harwich catcher Logan Driscoll (George Mason). A Jones single drove in Fryman a pitch later, giving the A’s a 1-0 lead. The Mariners evened the score in the sixth, as Danny Casals (Maine) belted a one-out double to the right field and came home on an Aaron Schunk (Georgia) single. After Jones’ stand-up triple in the seventh, Chatham’s first of the summer, put the home team ahead 2-1, the floodgates opened. Pinch-hitter John Rave (Illinois State) doubled to bring home Jones. Ben Ramirez (Southern California), another pinch-hitter, drove in Rave with a sacrifice fly a batter later. Blake Sabol (Southern California) topped things off with a solo-shot down the right field line, his third of the season. Sabol’s long ball seemed to be going foul but stayed in fair territory as it settled on the grass hill beyond the right-field fence. After Hammer’s 4.2 innings, Nick Scheidler (UCLA), Zach King (Vanderbilt) and Andrew Miller (Kentucky) kept the visitors to one run over the final 4.1 innings. The trio combined for 5 strikeouts and 2 hits allowed. The Anglers sported a lineup with some of their new faces, including Woley, Kahle and Ashton McGee (North Carolina). Each player had at least one at-bat for Chatham prior to Saturday, but each made their first start against the Mariners.